"Bleed a Creed: How to Create and Activate a Powerful Brand Purpose, by Matt Carcieri with Foreword by Jim Stengel"
Is there PURPOSE in your veins? If you're like most business leaders today, you believe in the power of purpose. That makes you part of one of the biggest movements in the history of business. Like a glacier reshaping the contours of commerce, purpose is fundamentally changing the discipline of management, the experience of employees, the fruits of capitalism and the future of the world. The businesses that are embracing this shift are experiencing greater success. According to recent studies, 80 percent of companies that over-perform on revenue growth link everything they do to purpose, and brands with a purpose have outperformed the stock market by 120 percent. Other studies show that Millennials are five times more likely to stay with a company when they have a strong connection to its purpose; and consumers are more likely to advocate for a brand based on its stand rather than its product features. But for the majority of companies and brands, the promise of purpose is not their reality. That's because their purpose is a platitude; it doesn't represent a heartfelt devotion that's authentic to the DNA of the enterprise. And more often than not, leaders haven't taken the actions that are required for it to penetrate the mechanics of the business. 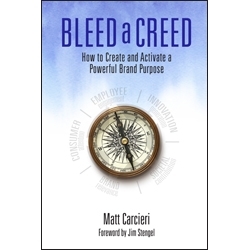 In this navigational guidebook, Matt Carcieri helps you overcome the "purpose challenge": the challenge of finding a true devotion and embedding it within your organization, brand and operations. Seven instructive chapters explain why great purpose starts with a definitive creed--a unique point of view--and then guide you on a course to successful activation.